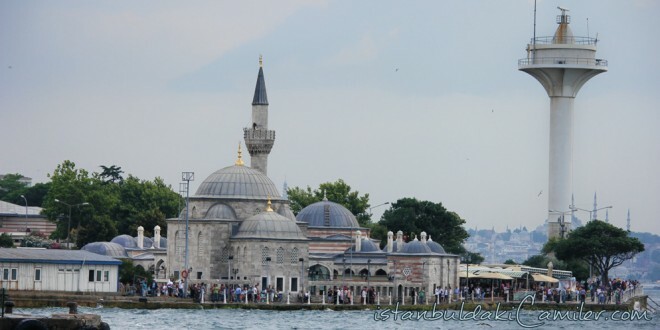 With is interesting position right by the seashore, its mass effectand composition, Sinan was able to create an original Kulliye (religious architecural complex) design, specifically adapted to the seashore. Despite its small size, the mosque has a remarkable appearance, with its adjacent mausoleum the courtyard according to an independ entaxis. Semsi Ahmet Pasha Mosque. The dome anditss quinches bring no architectural novelty. The building’scharacterarises from its positioning, the beauty of its proportions, its adjacent mausoleum and the late comers porch portico that surrounds the mosque on two side instead of the usual single one. Şemsi Ahmet Pasha Mosque, Plan.